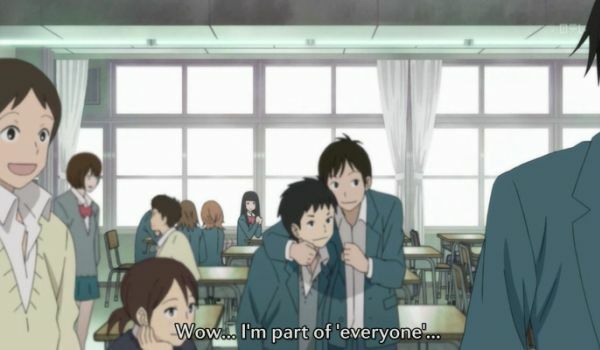 “Wow… I’m part of ‘everyone’…” From the family-friendly and encouraging anime “Kimi ni Todoke”, which probably means “reaching you”. It really is heartwarming, and no, it is not made by Happy Science. It is still good though. For a number of years, I have spent more and more time alone, to the point where I finally even played alone in the multiplayer game I played. It has been a very slow and gradual change. When I started writing this journal, I still had friends in the 3-dimensional world, although not many, and although I did not meet with them often. But gradually I lost contact with people, and I did not miss them. I enjoyed being alone. I also felt that it was a good thing, morally and spiritually speaking. I have never disputed the gospel of Jesus Christ, that “it is more blessed to give than to receive”. But the way I interpreted it was more along the observation by Socrates, that a god needs nothing, therefore to need less is to be closer to the divine. I thought that the less I received from others, the better. Which in a certain sense is true, since we tend to start out with an abundance of wants regarding what others should do for us. When Sartre could say that “Hell is other people”, it was in this sense. If people with conflicting wants are placed together, they will naturally create the conditions of hell, each inside himself by resenting the others. But while I was doing a great job of curbing my wants regarding other people – although in truth it is more like the wants gradually withered – I forgot the positive dimension. I was fairly happy even by my own standards, very happy compared to the overwhelming majority of people. And I thought “this is as good as it gets”. It did not occur to me, not needing others, that they might need me. In a sense, it is right and necessary to work on oneself, forgetting all others for the time being, to refine certain qualities of oneself. But at some point one should remember the purpose of this work: To be able to add to the total of brightness, happiness, hope and courage in this world. Because we are a part of “everyone”, even our thoughts count. But eventually we must begin to radiate these qualities of brightness, otherwise I must question whether they are there at all. A city on a mountain cannot be hidden, as my hero Jesus Christ pointed out. I do not know how far this change will take me. After all, I am naturally introverted. Even as a child I had a hermit streak, although I made up for it with incessant talking and grabbing attention when I was with others. And there are so few now who share even one of my interests, that just “hanging out with the guys” is unthinkable. At least I still have my work. And various online activities, with the benefit that people tend to be more open online than in the physical world. So let us see where this takes us. I will probably always be a hermit, but there are degrees of hermeticism too. More about this sometime, perhaps. Now, sleep, in the sincere hope of doing a decent job tomorrow, Light willing. This entry was posted in autobiography, philosophy by itlandm. Bookmark the permalink.